This TableTop King HK-SS-304M 30" x 48" stainless steel work table offers plenty of enclosed space to store equipment, and is built to stand tough against the rigid demands of the busiest kitchens! This versatile work table boasts a 5" backsplash that protects your walls from splashes and spills, while a fixed midshelf is also included to promote optimum storage flexibility. 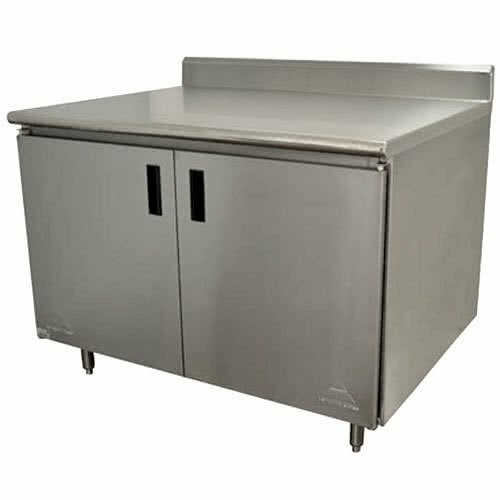 The work table's 14 gauge type 304 stainless steel top and 18 gauge type 430 body are supported by stainless steel legs and matching bullet feet. The double-panel hinged doors boast recessed inner panels for additional support. A convenient fixed mid shelf to keep mixing bowls, containers, prep supplies or even small kitchen appliances close at hand!